After a long time in the wilderness, Intro Quiz has been updated to work with the latest technologies in iOS. As a revenue model, ad support hasn’t worked well for Intro Quiz. The uptake on the in-app purchase to remove ads was very low, and the actual ad revenue not much better. We live & learn! In this update, all ad support has been removed and the app is now a paid purchase. The many thousands of people who downloaded the app before today therefore get a free upgrade, lucky them! In addition to the Mac App Store releases, we make beta releases available to testers for new versions. These versions expire after a month to make sure those using beta software update to the latest releases. Unfortunately a previous version in the Mac App Store (2.1.5) was built and submitted (on the 29th November) with the beta configuration, and therefore expired on the 29th December. Note that the 2.1.6 version previously available from this page has also expired. If you’re having the same problem simply drag the app to the trash, then download the update from the Mac App Store. You won’t need to pay again and your notes will be preserved. It had to be done this way, otherwise Sticky Notes wouldn’t update from the Mac App Store for you in the future. 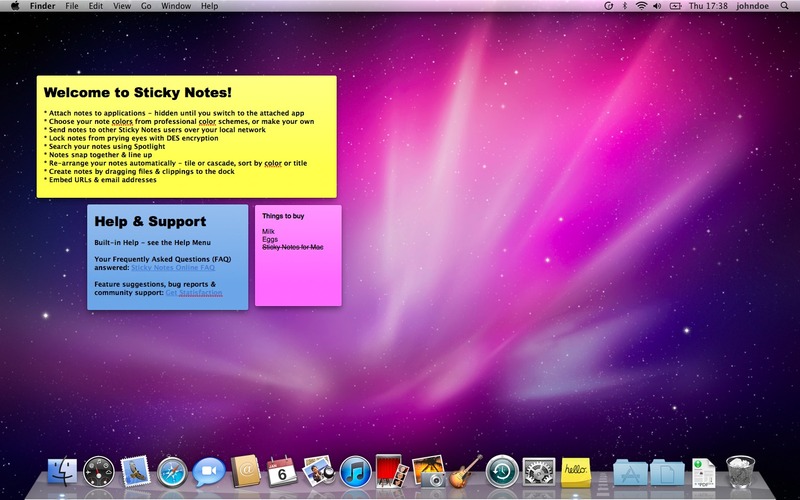 Sticky Notes 2.0, a major re-write of our desktop notes application is now available exclusively in the Mac App Store. Sticky Notes 2.0 requires an Intel Mac running Mac OS X 10.6 or greater. What's Happening at Random Sequence?